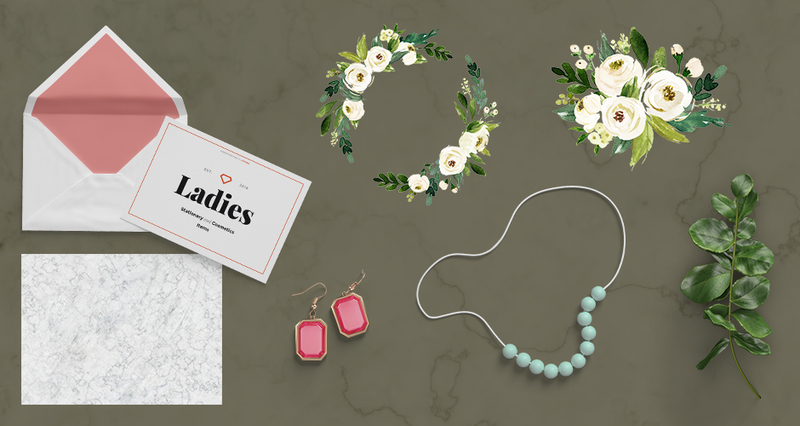 This freebie pack includes two watercolour floral illustrations and a few samples wedding mockup elements from the Wedding 3 Mockup Scene Creator courtesy of L Store. File types: this freebie pack contains .PNG and .PSD files . Thank you so much. Most impressive. Thanks for the comment on this one 🙂 We are so pleased you are liking this one! Can’t find molly ornament font is it free? The Molly Ornaments font that the designer used for this particular tutorial was included in our Create and Make Design Bundle, which we ran in July last year. As this deal deal has completely expired, this particular font is no longer available so we are so sorry for any confusion caused! We would be happy to help you locate a similar font for your collection Christopher as an alternative for this one, so please let us know and we can definitely help narrow down your search! No need of any rating and comment but anyway Awesome tut & thanks for the freebies. Thank you so much for your awesome comment and we’re so sorry for any confusion caused by trying to locate this font. This font was actually included in our ‘Create and Make’ Design Bundle, which we ran back in June so my sincerest apologies that this one has now expired. We would be more than happy to help you locate an alternative hand-written script font for you so that you can still create a similar effect to our tutorial, so please do not hesitate to pop us a message and we would love to help! where to find the molly ornaments font for free? It’s our pleasure Janet, we hope these will make an excellent addition to your collection! Thank you for sharing great materials. Keep it up! Thank you so much for leaving us a lovely comment and we hope that you get great use out of your new resources! Love the freebie and tutorial as always. Thanks very much. SJ, help! Have I lost my mind? Everyone is talking about a tutorial and I don’t see one. To the right of DOWNLOAD, there isn’t a tutorial button as there usually is. Can’t wait to use these freebies! My sincerest apologies for any disappointment caused and I hope this helps! Thank you for the tutorial and freebies! Thanks a lot! So excited to experiment with these and try something to improve my graphic design skills. We’re so glad to hear that you love these Freebies and the great news is that our tutorial included with these resources shows you exactly how you can change the colour of the inside of the envelope. Rest assured I have popped you over an email to help you locate these tips without further delay! Muchas gracias por el regalo y por el tutorial. Wow! Thanks for the freebies!! You’re so welcome, we hope you’ll love working with these freebies! Great! as allways, Thank you! Yeah!! I was trying to follow along the other day when I received the email but could not find this free set to follow along with tutorial, had to use other images I had. So glad I can start over, I am loving your tutorials and loving the way you explain how everything works. You have me hooked. Aww thank you so much for your lovely comment Julia and we are so sorry for any initial confusion when trying to locate our freebies for this tutorial. It’s great to hear that you love working through our tutorials and we hope that you have picked up some great new tips and tricks! Thank you for the free Floral Illustrations and Wedding Mockup Elements. Thank you so much for taking the time to leave us a lovely comment and we hope that you get lots of great use out of your new resources! Awesome,can’t wait to do the tutorial. Yay that is so awesome to hear Karen! We hope that you really enjoy working through this tutorial, and pick up some great new tips! thanks so much!! really is beautiful ! Woohoo we’re so glad to hear that you find this tutorial really useful Georgeta! We hope that you had great fun working through this one and will get great use out your new freebies! Thanks for the freebies and tutorial!! You’re so welcome Julie 🙂 We hope that you enjoy playing wth your new freebies!